A couple months ago, I backed a Kickstarter Project called Mystical Kingdom of Monsters. The project, in a nutshell, is basically a campaign setting that combines Dungeons & Dragons with Pokemon. Now, how could I not support this project. In one of the Rewards tiers, I pledged to design a creature to be available in the game. 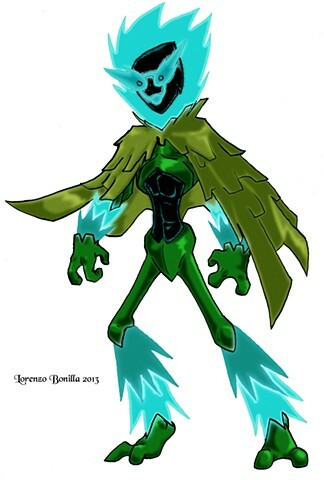 Once the project got its financial backing, I went around to creating the character. I brainstormed on what creature to design as they can be similar to existing D&D monsters, or a completely original creature. Now, the current (4th)edition for D&D makes it difficult to use existing monsters based on their User License Agreement, so an original design was a must to do. I had a think on the matter and decided to go to the well of previous creature designs and perhaps one monster I have developed a bunch of times over the years since that mythical character design lesson in Character Design Class was the Latin American Boogeyman, El Cuco. For those unfamiliar with the creature, it is a creature that kidnaps and/or eats children that parents use to scare kids into behaving that's name means "coconut". This version is the complete Colored version of my earlier drawing. I did the coloring in Photoshop using mostly the Select Lasso Tool for body shapes and shade details. I filled the base colors with Paint Bucket, used the Smudge Tool to refine shading, and the Gaussian Blur Filter to soften the shades and tones. I use Inner and Outer Glow F/X in the Layers Channels for the flames, while adding the Stroke Command to my selections to maintain the flame shapes. I added another layer over my Color layers with textures that are subtly placed on the body. I then erased the inked parts around the flames for visual flair. The finished piece is the one I submitted to Kevin Glusing, the game's creator. I also, for the liberty of making this creature fit within the campaign setting, I made this a Construct creature that serves as bodyguards to mystics as they possess phasing and teleportation abilities with the dangerous talent of copying and using other mystics spells. But, interestingly enough, that wasn't all I sent to him.